Looking to really stand out? 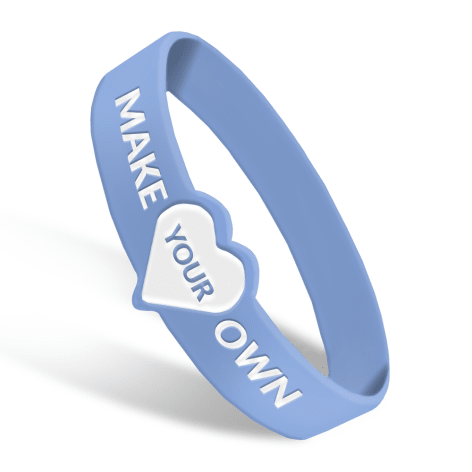 Our Die Cut Custom Wristbands are perfect for you! Custom mold your artwork or message. Each wristband project is completely unique! Custom die cut edges make your wristband really pop! Custom shaped, available in Youth, Adult, and Extra Large fits. Delivery in as quick as 9 Days using our rush option. saw the above review. spoke to me, son! i got a band too so i placed an order. just got them in the mail and now i'm here to tell tony he is the man. tony, i love you, bro! saw the pics of these and thought they would be great for my band. we uploaded our logo and they sent us a picture of the wristband in the email. i ordered and they were delivered in like a week or so. it could have been shorter or longer. i kind of got these a while ago and am coming back now for another order. we sold a ton at shows and people keep asking about them. defintiely a good cheap item for a band. these. are. awesome. i will definitely be back for more! Wristbands looked great, showed up a little earlier than expected. Sold a ton of them for a good cause. All in all, I'm quite content. Would use you guys again. Thanks! We received our order and the wristbands look awesome!!!! Thank you again for all your help, your company was an absolute pleasure to deal with and we will definitely use you again for any upcoming events in the future as well as we would happily recommend you to anyone we know running a function.